There are only 980 in the world! 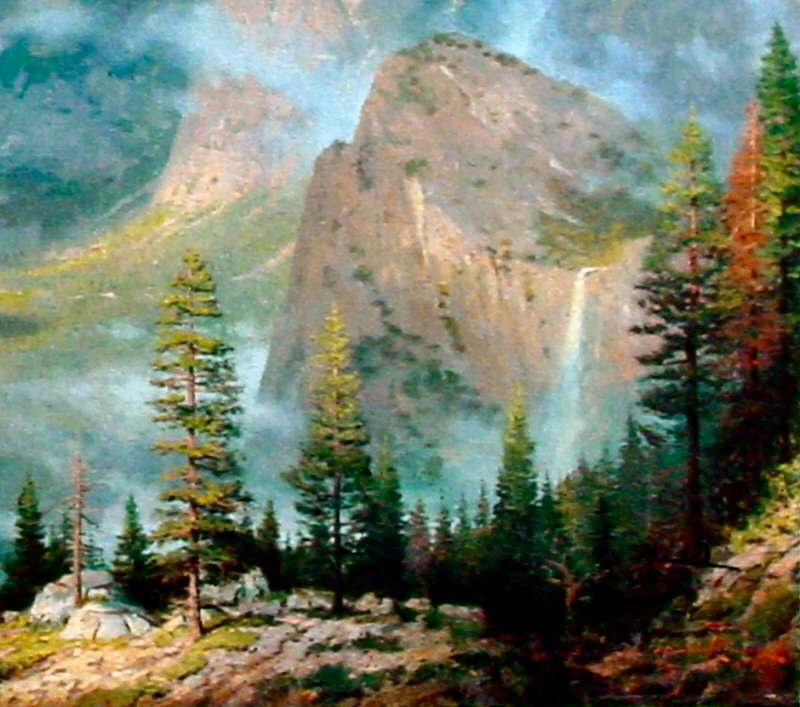 Yosemite Valley is a plein air study that depicts the Yosemite Valley as seen from a little known location called "Artist's Point," named in tribute to the many 19th century artists who favored it as a sketching ground. When Thomas Kinkade was only 30 years old, he won a contest over 2,600 other contestants to the National Park Service "Arts for the Parks" contest. 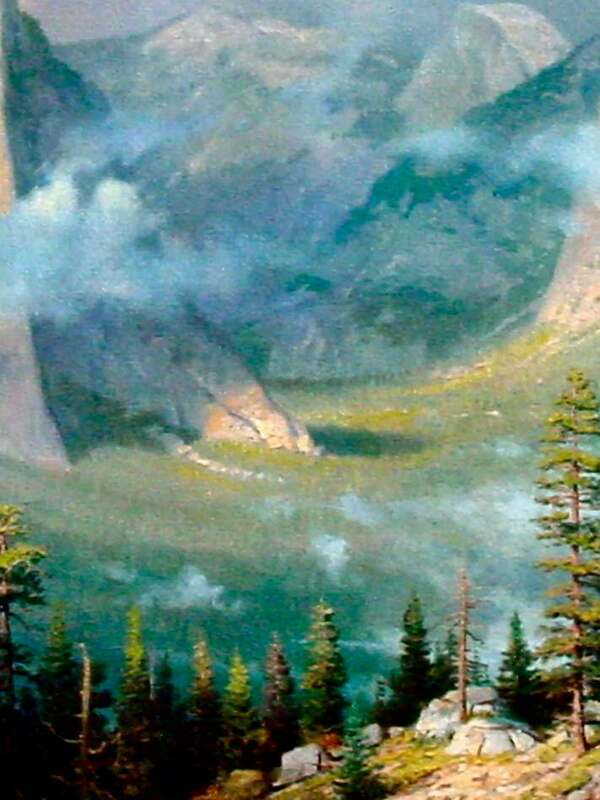 His painting, Yosemite Valley, won. This success launched him on to the national stage and started his upward spiral into being the Nation's #1 Artist. This image was used for the 1989 National Parks Stamp program and is embossed in the lower left hand corner with the Official National Parks Art Collection emblem. This is the ONLY Kinkade that was made into a stamp. 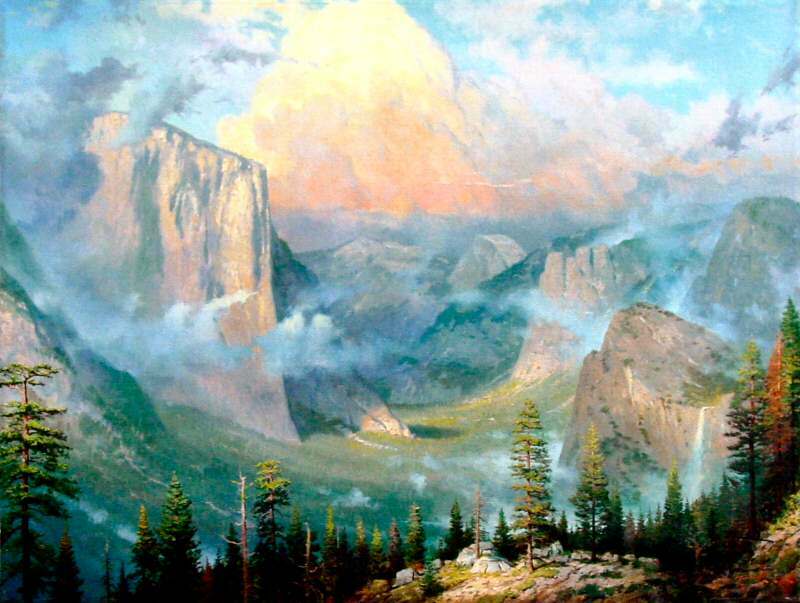 Yosemite Valley was used at the foundation for Thomas Kinkade's major studio composition, The Mountains Declare His Glory. ++++ Rare! This Edition is Limited to only 980 in the world! ++++ Theme ~~Landscape, Mountains, cliffs, rocks, trees, sky. "Driving the old Yosemite Valley ring road, I found myself in a familiar spot. I brought my paint and canvas onto that inspiring boulder, and, in little more than an hour of feverish, inspired work created Yosemite Valley. A powerful insight struck me as I carried the canvas to my car: these mountains are nothing less than an image of God’s grace. 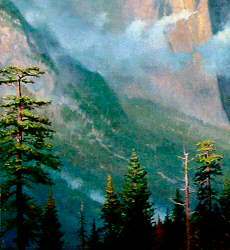 So returning to my studio, I used my Yosemite Valley study as a foundation for a major studio composition, The Mountains Declare His Glory." Do you know the definition of Plein Air? A Plein air is a Artwork done by the Artist on location, on the spot, in one sitting, at one time from beginning to end. Plein Air, a French term meaning literally "open air", refers to a style of Impressionistic painting that is created outdoors at a portable easel. The artist captures his surroundings at a given moment in time, before the specific lighting and mood of the moment slips away. Plein Air paintings attempt to render the full impact of this light on color, no matter the altered state, rather than adjust the hues to appear more "typical." There is an energy to the brushstrokes, as the artist captures the scene before light changes and the moment is lost. Kinkade has a passion for Plein Air painting. It allows him to capture the joy of the moment, so that he can share it with others for generations to come. *Plus $15.00 for very secure packaging materials and shipping within the lower 48 States.